We found this paper to be highly educational; it outlines the groundwork on which the Austin-Travis County EMS System protocols were formed, and offers insight on why certain assessment criteria was determined to provide the best patient care, in addition to providing a general instruction on prehospital management procedures and devices. Click here to read and download the document in full. For the practical purpose of injury management, it is best to think of the spine as a “long bone” with a “joint” at either end and to approach spine injury in essentially the same way that we would approach injury to any other bone or joint. Like other musculoskeletal injuries with potentially unstable bone fragments, the principal goal of field treatment is to protect adjacent structures from damage during patient movement and transport. In the case of injury or suspected injury to the bony spinal column, the principal goal of treatment is to protect the sensitive spinal cord from further secondary injury from unstable bony structures during extrication and transport. By some estimates, about 15% of cord injuries actually reflect secondary injury that might have been prevented with proper treatment. Treatment has little or no effect on primary injury; the only effective management involves seat belts, drunk driving laws, and other measures aimed at prevention. A great deal can be done to minimize secondary cord injury, however, and this is the focus of our treatment efforts. It is impossible to localize a spine injury to a specific area of the spine unless a) the patient and the exam are reliable, or b) x-rays or other similar techniques are available. Since neither of these conditions generally apply to initial management in the field setting, it is best to treat all suspected spine injuries as if the entire spine were injured. Remember that although the C-spine is the most common site injured, it is not the only site injured. Remember also that C-spine injuries are often associated with injuries to other areas of the spine. So it is best to refer to spine injuries in the field simply as “spine injuries,” and not as “C-spine injuries” unless the injury is known to be localized to the C-spine only. 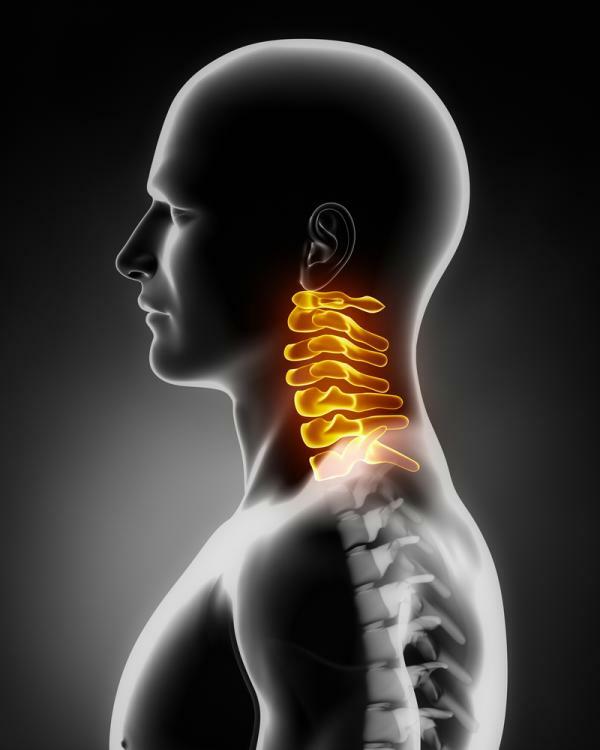 It is best to initially immobilize the entire spine until the specific site of injury is known. Like any other injury to bony structures, spine injuries should be treated by including the “joint above” and the “joint below” in the splint. Since the injury is assumed to be anywhere in the spine, full immobilization should include the head, neck, pelvis, and hips.